Targeted largely to young adults, and delivered on the platforms they use, we stitched together a unique portrait of NFL fans north of the border and their connection to the League. Through the power of personal storytelling and the energy and emotional resonance of music, we ultimately gave Canadians a coveted front row seat to the greatest game in the world. To date, the League has no Canadian-based team, and very few Canadian players who are drafted, much less actually play in the US. To see an NFL game, fans living in Canada have to cross the border. Canadians are the ultimate “displaced fans”. Despite that fact, NFL corporate partners wanted association with the most powerful sports brand in the world. More than 15million Canadians are professed football fans with 5 million plus identify as diehard NFL fans. To build the NFL brand in Canada, the League had to connect, engage and influence millions of casual and future fans in a way that was organic to Canadians and not that they were just like or even motivated by the same things as Americans. Additionally, the NFL could not look like it was competing with the Canadian Football League (CFL) which is the country’s home grown product. Find a way to cultivate football lovers who live in Canada t become diehard NFL fans. SMC LISTENed TO SOCIAL MEDIA in the TO IDENTIFY CANADIAN-BASED FANS WHO WERE 1. PASSIONATE ABOUT THE SPORT, 2. HAD Significant influence within their own online communities AND 3. DEMONSTRATED high quality, creative and consistent use of social media. SMC then InviteD a core group to become official members of NFL Canada’s digital Street team (DST). After educating them on accepted protocols and responsibilities and through the use of a social chat platform, melded them as an elite Buzz creation team and directed their social media conversations throughout the season. SMC triggered extrememly low cost, effective User generated Content by the DST and developed innovative mini campaigns to attract and engage MICRO FANBASES OF students, and women fans IN CONJUNCTION WITH THE ALREADY TYPICAL AVID FAN BASE. OFFLINE, WE INTEGRATED THE dst WITH SPONSOR EVENTS LIKE tHURSDAY nIGHT fOOTBALL bUDlIGHT PARTIES AND nfl ON-cAMPUS FAN EXPERIENCES. through a micro-video series called “prospect Diaries” SMC focused the public on the elite canadian players invited to the combine instilling further national pride and extending interest and buzz well after the season was over. for their participation, DST members received a cap and jersey of their favorite team, aN NFL.com gift card and the mosteffecive member won a trip for two the following season to a home game. 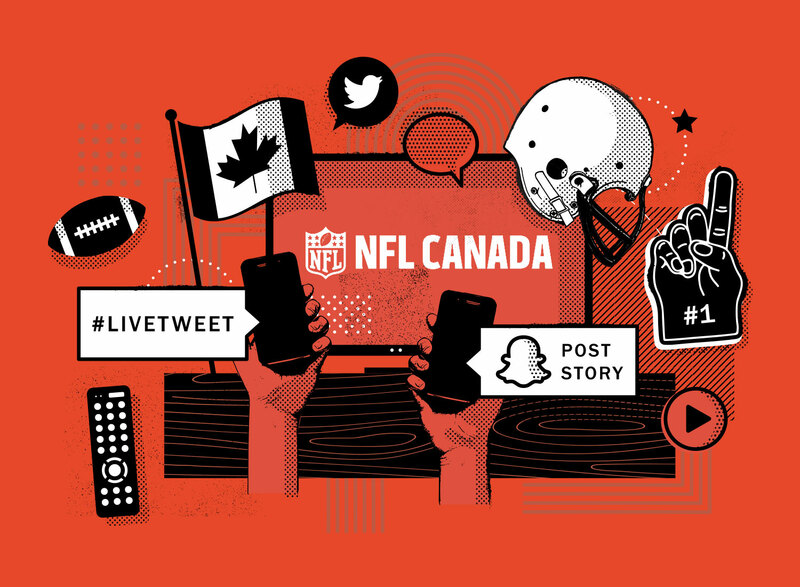 The NFL Canada Digital Street Team’s massive appeal proved that the League can generate extensive and valuable online brand conversations and awareness in Canada. Additionally, the DST made up of “everyday influencers” had the capacity to drive not only conversation but strong emotional connections that were manifested in sales, broadcast viewing and participation in NFL related activities on behalf of the League and its sponsors. Through the use of innovative grassroots social media campaigns, the DST fostered “the emotional connections that are key to attracting valuable new fans and turning many into lifelong fans”. SMC recommended the DST and content development focus predominantly on the League’s highest impact moments including the start of the season and the Playoff/Super Bowl, but was also able to extend the conversations into and throughout the offseason. Because SMC intentionally elevated the profile of each DST member by profiling them on official NFL Canada sites, other NFL fans publically clamored to become DST members themselves.